The FRED @School program is an international educational project organized by the film radio plattform FRED: The Festival Insider. Its aim is to introduce young students to European cinema and to change the perspective in which they watch movies in general. During the program, students from 8 different countries watched four films, discussed them and, with the help of FRED Film Radio, produced podcasts and broadcasts where they analized and discussed the movies even further. The project is amazing and I really hope that it is going to expand to a lot more countries all over the world. However, at the panel where we spoke about FRED @School, unfortunately there were no students there to speak about their experiences with the programm, but only the organizers as well as a few teachers. 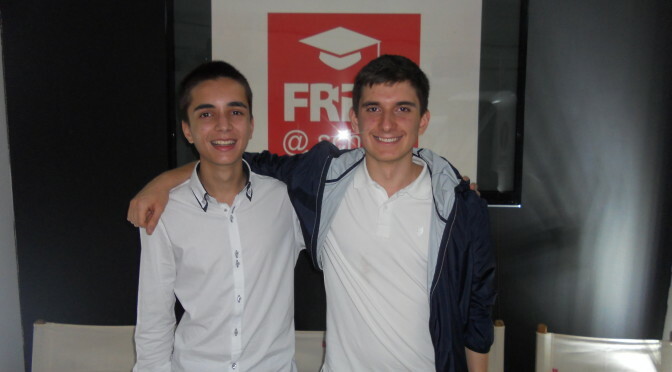 So when I met Alessandro and Stefano, two 16-year-old Italian participants of FRED @School, I sat down with them for a few minutes to ask them about their perspective of the program. I think it was a really nice and insightful though short interview, that I want to share with you now. Check out FRED The Festival Insider (http://www.fred.fm/), those guys are doing a great job for European Cinema! Question: Alessandro and Stefano, you both attended the program FRED @School this year, where you watched four different European films and discussed them with your classmates. First of all, did you choose to partake in the program or was it mandatory for your class? Stefano: The project was open to everyone from the school who wanted to, but our English teacher, Sandra Muzzulini, who coordinated it in our school, asked asked us about it, so the whole class ended up partaking with the exception of one student. Alessandro: In the beginning, there were two or three students from a parallel class, but they left the program after the first screening. How was the program structured? Would you watch a film and talk about it right away, or did you have two hours dedicated to the project every week? Alesandro: First, we had lessons about film, read some film literature, talked about film history, things like that. We had those lessons every week, for about two months. Then, we had one week dedicated to each film: We would watch the film and discuss it with our classmates and our teacher in the next one or two days. Then, we would write texts about it and prepare for the radio broadcasting. They were in Italian, but we translated them for the broadcasts as well. That’s right, you created radio broadcasts as well with the help of FRED. Did you get some experience in editing a broadcast, or were you mostly responsible for the content? Stefano: We just did the recordings. Those were sent to FRED Radio, where they were edited and published on the website and on iTunes. That was the first time that we came in touch with producing radio content, so we were a bit worried in the beginning. For the later screenings, we all were much more relaxed, and all of our classmates spoke up then. That was really nice. Alessandro: I thought it was very interesting. Perhaps I would like to continue doing radio, not just with this project, but with completely different topics as well. Stefano: I think film literacy is very important. It should be taught to students in all of Italy and Europe, and FRED @School helped with that. It is a good thing to know how to watch a film, to know when cinema was born, and to know the international classics of film, like Stanley Kubrick or Hitchcock. We would watch scenes from 2001 and The Shining to understand things like scene composition, camera movement and other technical details of cinema. But the radio broadcasts were really nice, too. At the panel about FRED @School today, the organizers and teachers kept talking about the impact the program had on the students. Do you see cinema in a different light now? Has the way in which you watch films changed after the program? Stefan: We only watched four movies together, so of course that’s not enough to know all there is to know about cinema. But when I watch a film now, I have a different eye on it: I try to understand the technical details behind the film, and reflect about the movie and the things it wanted to tell me. Alessandro: To me, films are a lot more complex than they have been before. You watched all the films in their original language with subtitles. Did you appreciate that, or would you have preferred watching a dubbed version of the movies? Stefano: In Italy, all the films are translated and people watch them in Italian. So a lot of people are not used to watching a film just with subtitles. For us it was an important thing to watch the films in their original language. We can tell now that we don’t have any issues with watching a film with subtitles, on the contrary: when a film is translated, some particular aspect of the voice or the character is changed. Alessandro: I agree, unfortunately, when we go to the movie theatre, all films are dubbed and we don’t really have the opportunity to see them the way they are supposed to be seen. Let’s talk a bit about Io Sono Li by Andrea Serge, the film that was chosen by the students partaking in the programm all over Europe as their favorite film. How did you like it? Why do you think it was a good choice? Alessandro: I really liked Io Sono Li because it showed how Italian society is changing as a whole as well as in a particular region, furthermore it explained a lot about the integration of chinese people in the local society. At times, we in Italy have some strong prejudices about them, and that is a terrible thing. Stefano: I want to point out though that all of the films – Io Sono Li as well as the others – were dealing with immigration, that was a particular decision by the organizers, and a good one. Talking about immigration is a very important thing, and it is a European topic, not just an Italian one. The young generation can get the opportunity to know more about immigration and begin an open conversation about it with the help of films, instead of just staying with a certain prejudiced opinion. FRED @School did a great job with that, and I think there are other themes that could be tackled in the same way, so I would like other editions of this project to deal with different important issues by choosing the right films. Last Question: Do you think, the program could also target an audience younger than you are to introduce them to European cinema, or would that not work out as well as it did with you and other students your age? Alessandro: I think 16 is the right age, so the program could even be for a bit older audiences. You see, the project was also open to 14 year old students, and I don’t think they are old enough to fully appreciate a film as complex as the ones that we have seen.